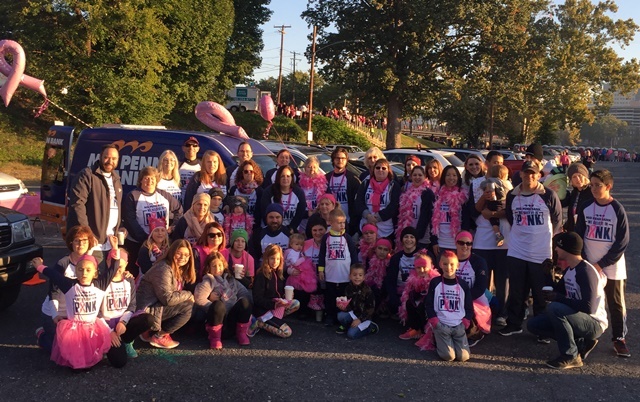 More than 75 Mid Penn Bank employees and family members recently participated in the American Cancer Society’s “Making Strides Against Breast Cancer” walk at City Island in Harrisburg. Bank employees raised more than $1,500 to support the walk. Making Strides Against Breast Cancer is the largest network of breast cancer awareness events in the nation. The dollars raised through Making Strides Against Breast Cancer walks help the American Cancer Society finish the fight against breast cancer through research, free information and services for those fighting the disease, and access to mammograms for women who need them. Mid Penn Bank is strongly committed to supporting charitable organizations through various means, including corporate donations, employee volunteerism and fundraising. An independent community bank since 1868, Mid Penn regularly contributes to causes including health and human services, community improvement and education.